Examples of how this spirit of equality applies to all, including those in high office, are illustrated by the following two stories that demonstrate how this is a reality. According to media reports, in 2014, the Australian Independent Commission Against Corruption (ICAC) alleged that New South Wales Premier Barry O’Farrell received two bottles of red wine from the president of the Australian Water Holding Company. It is reported that these two bottles of red wine were worth A$3,000 (about US$2,100). O’Farrell repeatedly denied that he had ever received this wine. However, after ICAC exposed his personal thank you letter, he announced he would step down. For the sake of two bottles of red wine, a capable politician who could have made a run for the position of prime minister of Australia withdrew from the Australian political arena and ruined his good future. Let’s take a look at Australia’s former Prime Minister Malcolm Turnbull. One day in 2017, when Turnbull was still prime minister of Australia, he was maneuvering a boat around in the harbor. As a result, he was surrounded by a large group of police officers and was given an A$250 fine. The reason for the fine is very simple. According to the NSW Water Traffic Law, everyone who operates a boat of less than 4.8 meters in length must wear a life jacket. 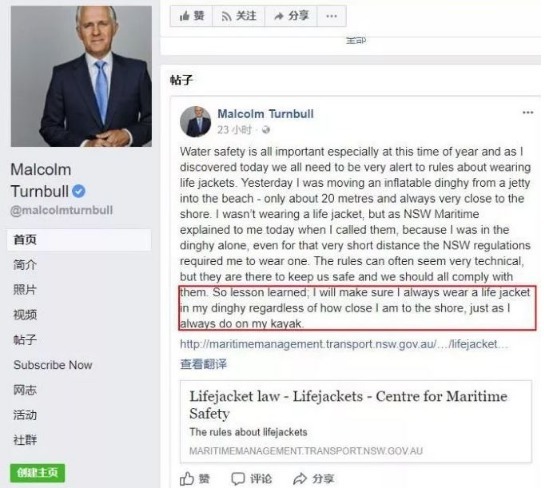 Turnbull was not wearing one. Many people love to immigrate to Australia, not only because of the good environment, good air, and easy living. Everyone is equal, even the Australian prime minister. The words “Respect for Life, Equality for All” in Australia are not casual talk, but the basic values that most Australians recognize. It is possibly the real reason why many people fall in love with Australia.